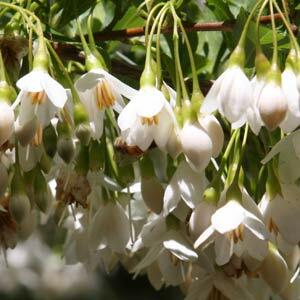 Styrax japonicus is a very attractive ornamental small tree is known as the Japanese Snowbell tree. Reaching around 10 meters in height depending on conditions. The cultivar Styrax japonicus ‘Emerald Pagoda’ is better suited to smaller gardens as it is a smaller cultivar reaching around 6m. The flowers that appear in spring are fragrance and bell shaped, usually masses of white flowers cover the tree at this time. In spring the pendulous drooping flowers that hang beneath the branches make a wonderful addition tom the garden and really are the main attraction, although the green foliage is attractive as well. Being a relatively small growing deciduous tree Styrax japonicus is versatile. It can be grown in medium sized gardens as a feature tree that provides some shade. It could be placed at the rear of the border or grown in larger gardens and parks as a feature tree. Also suited to growing beneath powerlines, especially the smaller growing cultivars. A humus rich well drained but moist soil in full sun to part shade is best. Pruning of Styrax japonicus is generally not required. Sometimes used as bonsai.